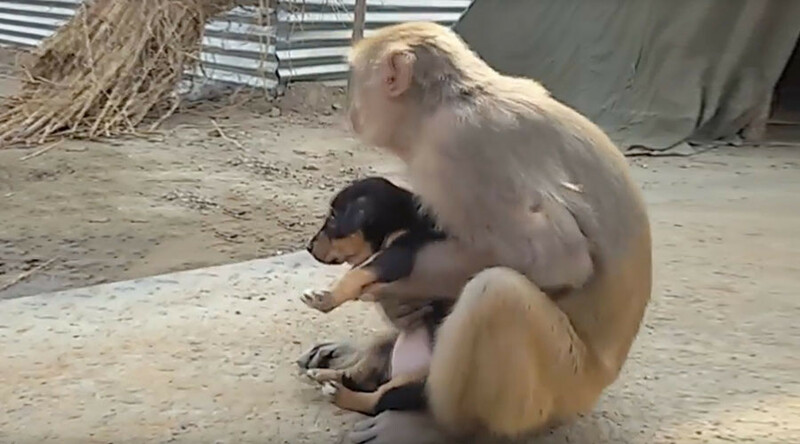 A stray puppy found a new home when a very caring rhesus macaque monkey adopted it in India. The new parent could be seen on the streets carrying the puppy in its arms as if it were its own child. Onlookers in Allahabad in Uttar Pradesh state filmed the new best friends as they enjoyed each other's company on the streets. The monkeying-around pair looked very content together as crowds followed them around the city. The monkey and puppy were given plenty of food and lots of love by their new fans.